In announcing his opposition to a bill being considered by Rhode Island’s legislature removing antiquated resale restrictions for event tickets in the state, new Attorney General Peter Neronha has cast his support for a system that requires consumers to take a loss on any tickets to events they cannot attend. The bill – introduced on February 8 by state representatives Robert Craven (D-North Kingstown) and Carol McEntee (D-South Kingstown and Narragansett) – is H5362. It is designed to “allow ticket holders to resell their tickets without monetary restrictions as long as they ensure a full refund if the ticket is faulty or the event is cancelled,” according to the Providence Journal. Support for the bill has come from companies like StubHub and TicketNetwork, which already offer consumer protections required by the revised bill. Venue and promoter interests have come out in opposition. Additional consumer protections that come with the proposed legislation include provisions that the sellers of tickets cannot enforce a price floor on resale tickets, that consumers receive a full refund in the event any show is cancelled, and that consumers be allowed to remove personally identifiable information from tickets that they cannot use and wish to list for resale. “We support any bill that allows consumers to actually own a ticket as personal property,” TicketNetwork CEO Don Vaccaro told the Journal. AG Neronha, however, has come out on the side of the promoters, who hope to retain a current cap on ticket resale in the state, which limits legal resale at the greater of $3 or 10% on top of the face value printed on a ticket. Current law also makes it perfectly legal for venue operators to use restrictive ticketing systems that lock a ticket to the original purchaser via the need to present photo ID or credit card at venue entry. In several states, such restrictions have been declared unlawful, including neighboring Connecticut and nearby New York. Other states, including Massachusetts, have bills seeking the banning of such restrictions against the consumer doing what they like with tickets once they purchase them currently under consideration. Opposition to the current rules in Rhode Island stems largely from the documented fact that the face value on a ticket frequently omits huge post-price service fees that the consumer has no choice but to pay. If the printed face value of a ticket is $49.95 but the venue adds another 40% in service, delivery and other fees on top of the price, consumers are actually breaking the law if they list tickets for sale at the amount they actually paid for a ticket, because the add-on fees from the venues and promoters are far in excess of the current markup cap. “There are hundreds of thousands of Rhode Island consumers who have committed a crime selling tickets for as much as they bought them for,” Vaccaro told the Journal. Venues frequently trot out examples of tickets listed on resale websites for far more than face value in their opposition to consumer-friendly updates to ticketing law. In Rhode Island, the example was the ever-popular Hamilton musical, which has some tickets listed for many times face value on some marketplaces. They also rail against the concept of “speculative” tickets, where some individuals list tickets for sale prior to the actual tickets being distributed by the venue – regardless whether those individuals are season ticket holders with the right to purchase those tickets guaranteed by their contract. 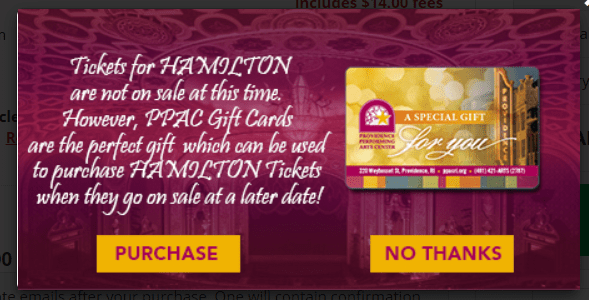 Presumably those gift card purchases include exactly zero guarantee that tickets for Hamilton will be available at that later date when they go on sale, and consumers can’t get a refund on them if they don’t score those tickets… which any speculative ticket sale would have to provide should tickets not be available (by both marketplace rules and law). Emails requesting a clarification on why the AGs office has sided against consumers on this bill written by members of Neronha’s own party have gone unanswered as of Monday afternoon.